If you are currently working on paying off debt, have you set a “debt-free date” yet? I’m not talking about going out with your spouse without using a credit card. I’m talking about a date on the calendar when you plan to be completely out of debt. If you haven’t set a goal for when you plan to be done paying off your debt, I encourage you to set one now! If you are married, sit down and do this with your spouse. In order to be successful, you need to decide together and both be invested in the goal. First, take a peek at the total number, but don’t have a heart attack. I know some of you prefer not to look at the total regularly because it makes each effort and payment feel like a tiny drop in the bucket. Normally that is fine, but if you want to set a date to be completely debt-free, you are going to have to look at it all. If you would rather just set a smaller goal (like a date for paying off one of your loans) that’s an option too. Instead of just choosing a random day (or significant day), crunch some numbers first. A well thought-out and researched goal will be easier to achieve. Play around with a calculator like this one. You can go about it in two different ways: time frame or payment amount. If you have a time frame already, you can start there. Enter your debt information (totals, interest rate, minimum payment, etc) and see what the payment schedule is like. Will the monthly payment be manageable? Will it be manageable for the entire time frame. The other option is to look at how much you can pay each month once you cut all the fluff. Enter those numbers in the calculator and see what the time frame looks like. Experiment with different payment. What if you pay just $100 more each month? Play around with the payment amounts to get an idea of how adding to your monthly payment will shave time (and interest) off of your loan. If the time frame is much longer than you expected, you will want to do whatever you can to pay more than the minimum payment. When we set our goal (debt-free by the end of 2016) we did a combination of the two. Time is a big deal for us, not just to save loads on interest, but because we are currently living in my in-laws’ basement. We want to make the most of our time here by putting as much as we can toward our loans. We experimented with the monthly payments required to be debt-free in different time frames. WRITE down your debt-free date and TELL someone about it. You can write in your journal, on your blog, or put it on the fridge. Writing down a goal makes it real and helps you be personally accountable. Telling someone will contribute to the accountability and will hopefully get you some cheerleaders! If you’d like, you can comment below what your goal is. Get pumped– this is going to be great! I’m excited to have met so many of you who are eager to payoff your debt too. I feel encouraged when I read your comments. I am rooting for you in your struggles. Let’s work hard to do great things! For more on how to get started paying off debt, see this post! Do you have a debt-free date? Feel free to share! Tell us about your progress! That sounds like a great way to start your 30s Allison! I don’t have a date yet, but I have an idea when I’ll be done with my mortgage! It is always good to know what you are paying, how much and when you’ll be done. Having a debt-free date is a good way to keep yourself motivated. Yes, I think the motivation factor is huge. Without a date, it doesn’t feel as urgent. I like the idea of a debt free date. Might have to try this. Thanks for the idea! It really does help to push you and make paying off debt a priority. I think (I haven’t done any real research) that people who set a date get done faster (and accomplish more in general) than people who don’t. We are aiming for January 2015 but that is definitely a challenging goal! We looked at how much we paid off this year and added a few thousand for raises and also just to keep us motivated till the very end. I’m hoping we can do it! I am right there with you on the challenging goal Courtney! Just one year left… that’s great! You can do it! Our goal is Jan., 2016. It’s a pretty aggressive goal and I don’t know if we’ll be able to do it. However it has been kind of fun and challenging to see where we can cut an already frugal budget. Even if we don’t hit this date, we will be paying off our loan much more quickly than if we had not set this goal. I’ll be exploring a whole new level of frugality. I do love a challenge though! I agree that you will get a lot further along the path by setting a goal (even if you don’t reach it), than if you were to not set a goal. Our budget was already pretty frugal too, but we enjoy a good challenge. It will be fun! I have over 120k in student loans, ugh, talk about depressing. It’s between 7.9 and 6.8%. This is the only debt that my husband and I have aside from the mortgage on the house we have in the UK. We’re hoping to sell that in a couple of years and put the money into retirement savings for my husband. I started out at 149k, but we have paid off 31k since March 2013. My goal is to pay it all off by October 2016 by putting $4250/mo into the loans. Ideally we could do it sooner, but as it is my biggest loan won’t even be paid off until November 2014. I’m glad to know there are other people out there doing the same thing! Our situations are so similar. Paying off $31K since March is pretty impressive! Keep up the good work and before we know it we’ll both be done! We’re taking a similar approach to our mortgage-debt free date. We haven’t nailed it down completely just yet, but hope to soon! That’s awesome that you are eager to pay off your mortgage debt! Love this, Stephanie. We are in a situation now where we can’t set a debt-free date (or, it would be too far out to motivate us) so we are focusing on month-to-month goals for now. After just completing our first year of budgeting and spend-tracking, though, we’ve got a better handle on where our cash is going, so that goal-setting for 2014 won’t be so daunting. Best of luck to you on your 2014 goals! Great job in 2013! Having a year of tracking your spending will make goal-setting much easier and more realistic. Good luck to you in 2014 too! My ideal goal is December 31, 2014, but that is very lofty and dependent on my side hustle this summer. If not then, the end of my third year of teaching: June 2015. That’s an awesome goal! This is going to be a big year for you. Keep up the good work! This is great. Our debt free date is in 2018. That’s when our mortgage will be paid off, we don’t have any other debt. I can’t wait! That’s awesome Kay! In terms of mortgages, 2018 is just around the corner! Being completely debt free will be so exciting! I have been lurking around and reading all of your posts for a couple of hours now. I decided I would comment on this post. My husband and I met 4 years ago. I had roughly $1500 left and debt. My husband had just graduated from school and bought a new (used) car and had roughly $30,000 in debt. In four years we got married (paid in cash), bought me a new car(paid in cash), and moved across the country (paid in cash) for a job opportunity. Luckily, we didn’t add to our debt for any of this, but it slowed down our goal of paying off the debt quickly. In the last four months we have really followed Dave Ramsey’s plan and our current debt total is down to $11,221. Our soft goal to pay down debt is July 2014. Our hard goal is December 2014. Wish us luck! Thanks for taking the time to comment CeCee. That’s great that you have paid down so much of your debt so quickly and that you have avoided adding to your debt by paying cash for your other major expenses! It looks like 2014 will be an exciting year for you two! Keep up the good work! I’m excited to hear of your success later in the year. I’ve been too scared to set a debt free date until now. I have good estimates, but with my working situation up in the air right now it seems impractical. However, maybe that is exactly what I should do and then I won’t let myself feel guilty about going part-time for the sake of our debt payoff. Hmm.. I actually set a debt-free date—though I didn’t name it—for my student loans late last year. Last year was the year that my income and expenses finally started leveling out to something fairly predictable, so I sat down with a loan calculator and plugged in the highest payment I am comfortable with making every month (since my car’s dying and I need to save up for that too!). My debt-free date is May of 2015, and I can’t wait! That’s awesome Elizabeth! Good for you! You will be there soon! Keep up the good work! My husband and I started in August working towards a debt free life. We have two toddlers, 2 and 3, and our financial goal is to be completely debt free (mortgage included) with 6 months of income in savings by the time my son turns 10. Ultimately, that made our goal 7 years to pay off just under $200k with $20k in savings. We are 7 months in and have gotten rid of about $30k while I’ve been a stay at home mom. Way to go Jessica! That is an awesome start and a wonderful goal. Doesn’t it feel great to make progress and work toward a big goal together?! I will be debt free by the end of 2015. My truck and 2 medical bills will be paid off this month. 1 credit card will be paid off by July. My large credit card and student loan will be paid off by the end of next year. That’s great Rosey! It sounds like you have a plan all worked out! That’s exciting to be so close! Best of luck! Our debt free date is May 2017. It could be sooner depending if my husband get a promotion within the year. Our total debt is 36,000!! At only 22 and 24 years old! We hope to be able to pay it off by then, while being able to save up for our first home. Any suggestions for those of us with multiple loans? My husband and I have been working hard on our debt (mostly student loans). We’ve been using the debt snowball method which has been working well for us. I just found this website looking for more inspiration to stay on track. The problem is our loans have different interest rates, minimum payments and so on. If I’m planning on minimum payments + focusing on paying off one at a time, is there a way I could figure out how long it will take? It would be great to have a date in mind, and to see if we can move that date up any faster. Thank you so much for your great advice ! It’s helpful for all of us to have supporters! Hi Melissa, a great tool to use is Ready For Zero. I talk a little bit more about it in a post about deciding on a debt free date. Keep up the good work!! My husband an I are currently in $57,000 worth of debt, which can be extremely overwhelming. None of it is credit card though, we pay those off monthly, and use them more for convenience than anything. It is a mixture of a car and student loans. yuck! However, when I first looked at the “big number” it was close to $85,000. My goal is November 2017, 3 years from now to be completely debt free. We actually may finish sooner thanks to a pay raise hubby is slotted for in January and job I will be starting soon myself (husband in military, and the job market on a small American post in Germany is not so good). To keep this goal we need to pay a minimum of $850 per pay period towards loans, or a total of $1700 a month. We also put a monthly allotment towards both of our retirements and an emergency fund. I can’t wait to be debt free!!! It sounds like you have it all planned out Julie! You’ve come a long way from when you first saw the big number! Keep up the enthusiasm and you’ll probably exceed your goal! I think my debt-free date will be in three years when my husband finishes his bachelor’s degree. I want to be debt free on his graduation date. Because we’re going into med school (well he is) and I want to make sure that we’re debt free when we enter med school because then we’ll have to tackle on the bigger student loan debt. Thanks for sharing this! That’s a great plan! It will be nice to start med school with a clean slate! 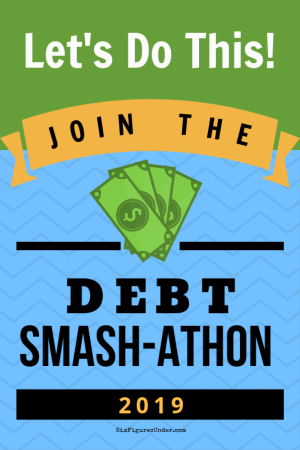 We set a super challenging goal in January of this year to get out of our $32,000 worth of debt by the end of 2015! That puts us at allocating $3000/month toward debt for the rest of the year! For the most part, all but necessary expenses have been cut, and we’ve set a very strict budget. Our [small] tax refund and both of our bonuses will be going toward debt this year, as well. The way I see it, if we end up having to pay off our debt in 16 months rather than 12, I’m totally fine with that! Setting such a challenging goal keeps me motivated (and I’m the one that needs the motivation!) and on track!